McKinseyites may be a secretive elite with the ear of the powerful, but has The Firm grown too big for its boots, wonders Roger Parry, himself an alumnus. Consulting firm McKinsey & Co has been saddled with lurid descriptions: 'Jesuits of commerce', 'Marine Corps with calculators' and 'MI5 with MBAs'. 'The Firm', as it nicknames itself, is sometimes described as secretive and reclusive. This book debunks many McKinsey myths and gives a deep insight into its culture and leadership. But it is not uncritical and there are parts that McKinsey and its 23,000 alumni won't like. Duff McDonald has done a phenomenal amount of research and seems to have enjoyed access to many of McKinsey's normally reticent managing directors. The notable exception is Rajat Gupta, who was convicted in 2012 of insider trading in the US. 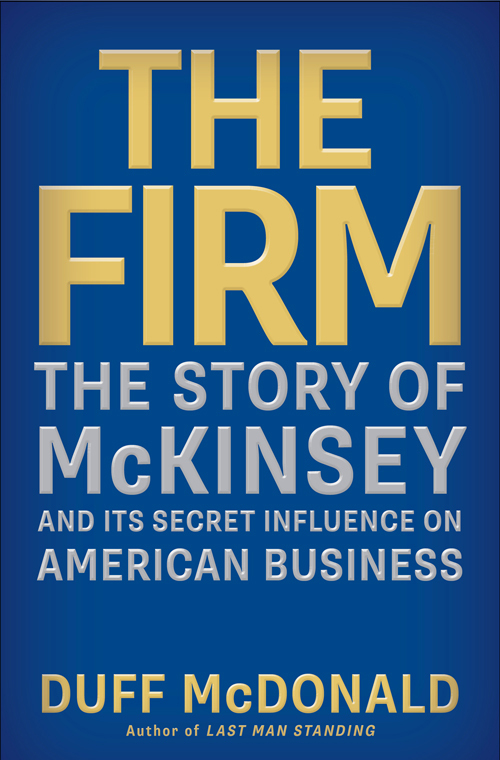 It is the notoriety of this scandal that validates the book's description of McKinsey as 'controversial'. And it is probably why so many senior people agreed to be interviewed - to redress the reputational damage. James McKinsey, a Chicago accountant, in effect invented management consulting in the 1920s when he peddled some revolutionary ideas about budgeting. His firm was honed and polished by his protege Marvin Bower, who established principles and practices that have resulted in a highly distinctive or, as The Firm seems to suggest, a slightly sinister culture. Fuelling the cult idea, the book makes much of Bower's dress code, demanding, for example, that consultants all wore long socks, and the suggestion that only tall, good-looking candidates would be favoured. Much has changed since but McKinsey's recruitment regime remains painstakingly selective. The author's own McKinsey description is 'the corporate mandarin elite... doing behind-the-scenes work for the most powerful people in the world'. As might be expected from a top-flight financial journalist (McDonald is a star Fortune writer), the book takes a balanced approach. Indeed, at times it feels as if it's trying too hard by raising a lot of contrasting questions without always answering them. He takes a particularly American slant that leads to some surprising oversights. No one who passed through McKinsey in the UK in the past 30 years would have missed the influence of Brigadier Harry Langstaff, who played a central role in recruiting and training, but he warrants not a mention in 400 pages. The Firm's narrative is structured like Chinese history - a series of managing directorial dynasties. This results in an overfocus on the personalities of individuals, to the cost of Gupta, who is portrayed as 'greedy' for turning McKinsey 'from a profession into a business'. By contrast, Ian Davis, the first British managing director, comes out well as the man who returned it to a higher purpose. And his successor, incumbent Dominic Barton, is painted as almost a candidate for beatification for saving the firm. In a rather gloomy epilogue, McDonald concludes that McKinsey has grown too big: 'The greatest challenge... is managing the complications that have resulted from its own stupendous success.' He is almost certainly correct. In the 1980s, the entire staff in London was able to sit in one room to have lunch together. Today, with more than 17,000 employees globally, McKinsey is changed beyond recognition. To summarise, and to adopt the author's own Socratic style: Is this a good book? Yes. It is meticulously researched, well-written, and comprehensive and balanced. Is it enjoyable? Yes. Is it for everyone? Not sure. With the exception of the racy sections on Gupta and malfeasance at Enron, it is quite dense. However, McKinsey receives some 225,000 job applications annually, which may ensure healthy sales of The Firm for many years to come.